Portland-area hikers face a challenge every fall and winter: How do you stay active on the trails when so many hikes depend on nice weather to unveil breathtaking viewpoints? Given that we're solidly in the midst of Oregon's rainy season once again, can hikers really hope for sun breaks to illuminate clifftop views and other spectacular viewpoints throughout the region? Probably not. But that doesn't mean you have to put away the hiking boots for another six months. The Columbia River Gorge and Willamette Valley are home to some of the most beautiful waterfall hikes around Portland (and beyond) that look great in any weather and are usually accessible year-round—and the steady rainfall means powerful, scenic waterfalls all winter long. Here, five of our favorites, from a new twist on the well-worn Multnomah Falls hike to the underrated Dry Creek Falls trip near Cascade Locks. The Eagle Creek Trail is among the finest treks in the Columbia River Gorge, and for good reason: The hike introduces outdoor enthusiasts to roughly 20 waterfalls (some more dramatic than others) over the first seven miles, delivers awe-inspiring canyon views, and can be done as a quick day hike or longer weekend adventure. 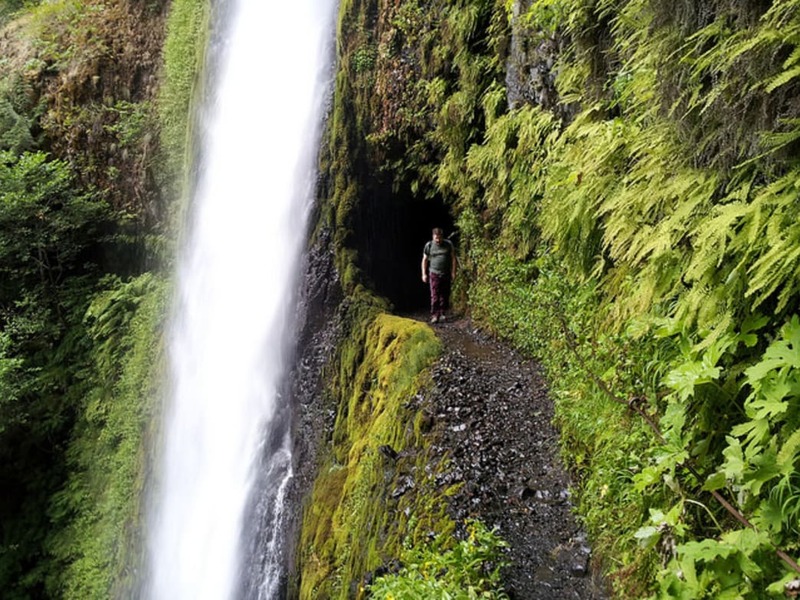 Punchbowl Falls provides an ideal turnaround spot for those pressed for time, but the 175-foot Tunnel Falls is the trail's crown jewel for serious day hikers. Eagle Creek is worth a standalone visit on its own any time of year, but the recent rains—which give the trees and plants their vibrant hues of green and bolster the raging waterfalls—only add to the charm in fall and winter. 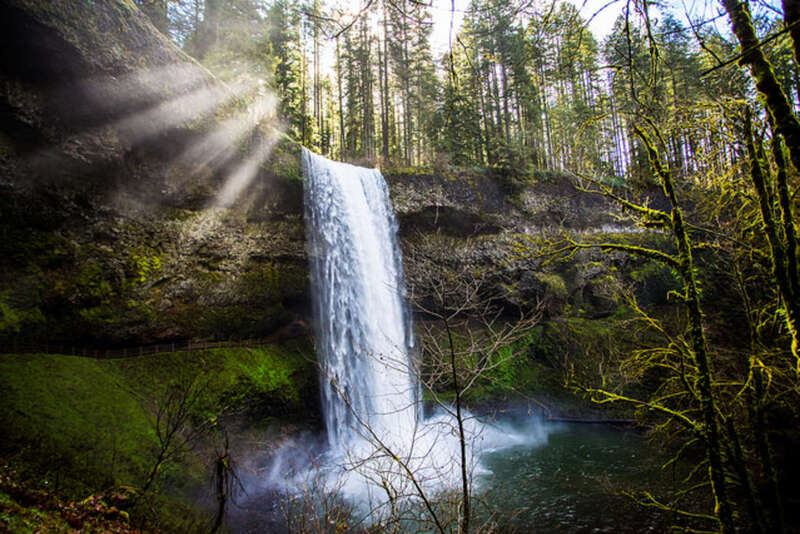 Silver Falls State Park attracts nearly a million visitors every year, and it's not hard to see why: The 8.7-mile Trail of Ten Falls loop hike delivers better waterfall views—and more of them—than just about any waterfall hike in the state. Ten majestic waterfalls range from 27 to 177 feet tall along the route, but hikers get to enjoy deep, opal pools, lush, green canyon views, and well-maintained trails in between viewpoints. Even better: The falls become more majestic as winter wears on, thanks largely to ongoing rain. The appropriately-named Winter Falls, for instance, is a leaky faucet every summer (when crowds are at their heaviest), but weeks or months of regular rainfall turns it into a memorable destination in the colder months. Want to learn more? Check out our guide to winter camping at Silver Falls State Park. You can be forgiven for wondering if you're in the right place before setting out on the Dry Creek Falls hike: The trailhead sits in the shadow of the impressive Bridge of the Gods in Cascade Locks. But it won't take long before you're in the midst of dense woods and en route to one of the hidden gems of the Columbia River Gorge. 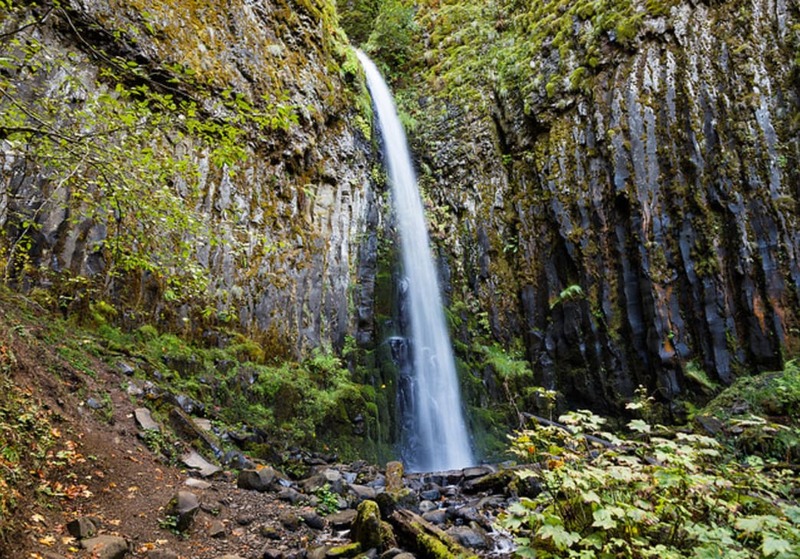 It's a leisurely 2.2-mile hike (which offers beautiful fall colors every autumn and vibrant wildflower displays every spring), and the destination is a 75-foot waterfall that cascades over a wall of (appropriately-named) columnar basalt. Take note: The Bridge of the Gods trailhead is closed during the winter months, so hikers may need to start on nearby Moody Street. 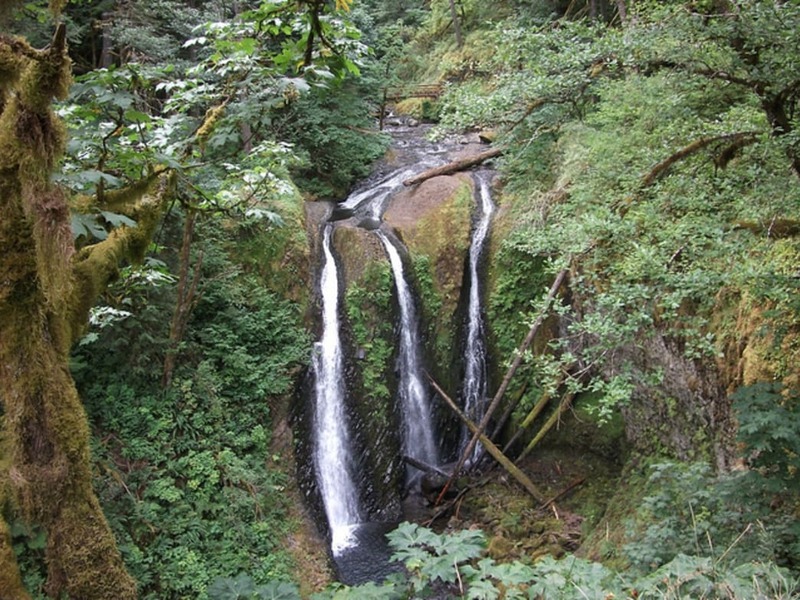 The Horsetail Falls/Triple Falls Loop introduces hikers to two of the most popular waterfalls in the Columbia River Gorge. Horsetail Falls is beloved for its jaw-dropping 176-foot drop and proximity to Interstate 84 and Historic Columbia River Highway; Triple Falls, meanwhile, is one of the most-photographed waterfalls in the region, thanks to its unusual shape. The Triple Falls trail challenges hikers with a trek that dabbles in extremes: Its leisurely, flat trail takes hikers through lush forests dotted with big leaf maple trees, but steep switchbacks make for an occasionally grueling hike. The payoff is worth it, though: Each of Triple Falls' three streams range from 100 to 135 feet, and—somewhat unusual for a waterfall—they're are surrounded by massive trees and electric green moss. 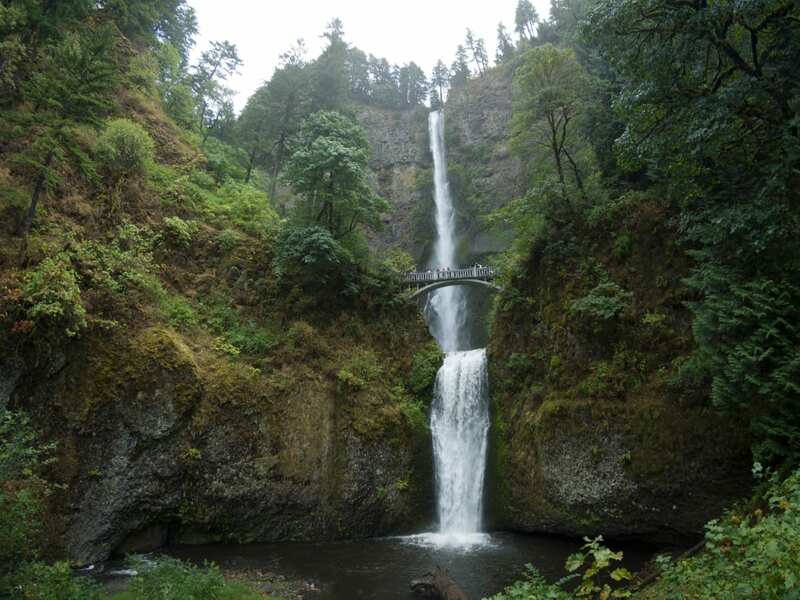 An article about Portland-area waterfall hikes would be woefully incomplete without a nod toward Multnomah Falls, which is consistently ranked as one of the busiest—if not the busiest—tourist attraction in the state. You've probably visited before and may even have a few shots dotting your Instagram feed. 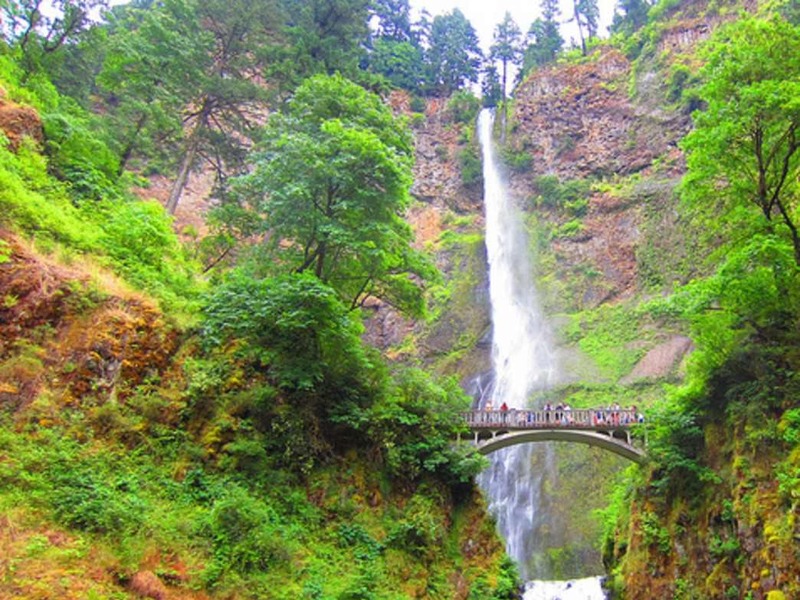 But the Wahkeena Falls/Multnomah Falls Loop promises a new take on the classic trip. 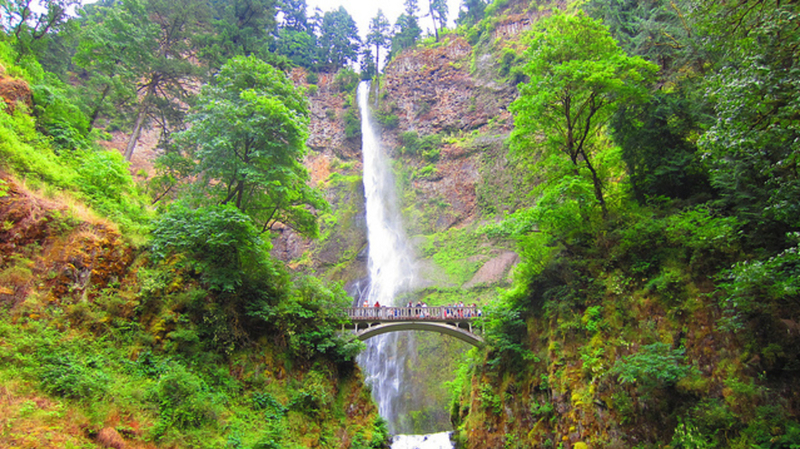 Rather than fight the crowds at the base of the 630-foot Multnomah Falls, park near Wahkeena Falls and take the trail from there. It more or less hugs the waterfalls through a series of switchbacks before leveling out and entering Wahkeena Canyon. The trail gets pretty level from here and even passes a few other picturesque waterfalls before descending the Multnomah Falls trail (where you'll pass by jeans-clad tourists on their way up). A quick return trail connects the Multnomah Falls and Wahkeena Falls parking lots, making for a quick, safe return just off the Historic Columbia River Highway.